Given the oversupply of eligible but unemployable manpower the importance skill based IT certification has grown phenomenally in last decade. The average salary of the IT professionals with IT certification is 50% or more than the Non-certified workforce. 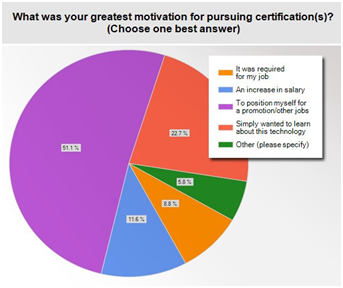 IT Certification has become biggest entry level differentiator for job seekers. In today's competitive IT job market having the right certification can help push your resume to the top of the stack or push you ahead of your colleagues when the opportunity for a promotion arises. Once you have decided on your career goals and objectives you can identify the IT Certification which is right for you. Certifications are a great way to break into a new technology, cover gaps in your resume or advance your current position. With more than 1,700 professional IT certifications running the gamut of IT technologies, knowing which certifications are the most important for your specialty can seem an insurmountable task. To help you meet the challenge, we've sifted through data from to narrow your search and bring you a manageable list of the most relevant IT certifications for near future. - What are your career objectives? - What IT career are you most interested in? - What type of resources are needed (i.e. money and time)? - Will this certification have a significant impact on my career? Certifications indicate to employers that you take your job seriously and that you are knowledgeable on the respective technology. Taking the time to think about and document your response to these questions can help solidify your future goals and narrow your list of potential certifications further. Tip: Once you've identified a role you'd like to advance to, look through naukri, Monster, Dice, CareerBuilder and other sites for those positions and see what IT certifications employers are looking for. You may find that on-the-job experience is what employers are searching for in one area of your expertise, so it would be logical to invest your time and money into certification in a different area to further your career goals. 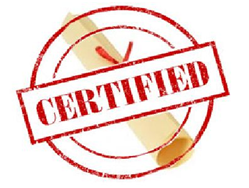 Bonus Tip: You'll find a must-have utility for your IT certification toolbox at Go Certify. The Certification Advisor allows you to plug in your area of expertise, skill level, career goals and more to generate a list of recommended certifications.